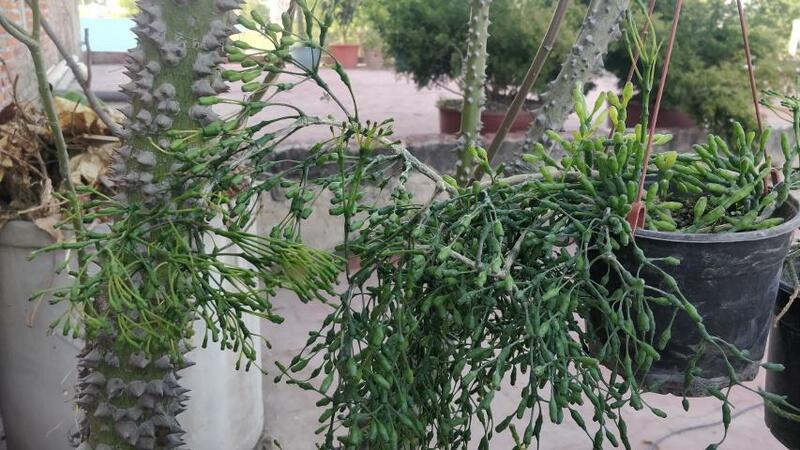 After looking at hundreds of Photos of rhipsalis my eyes which are normally quite crossed have begun to strighten out and tthe closest I can find to my plant is hatiora salicornioides which i don't feel confortable with. It looks like your research has yielded the likely correct name for your healthy looking cactus. BTW, I like the trees behind your 'Drunkards Dream'. Are they Ceiba insignis? Hatiora is a wonderful plant. Takes frost without missing a beat, and colors up red and orange when stressed. BTW, I like the trees behind your 'Drunkards Dream'. Are they Ceiba insignis﻿?